Meares and Associates, LLC. | Welcome to Meares and Associates, LLC. 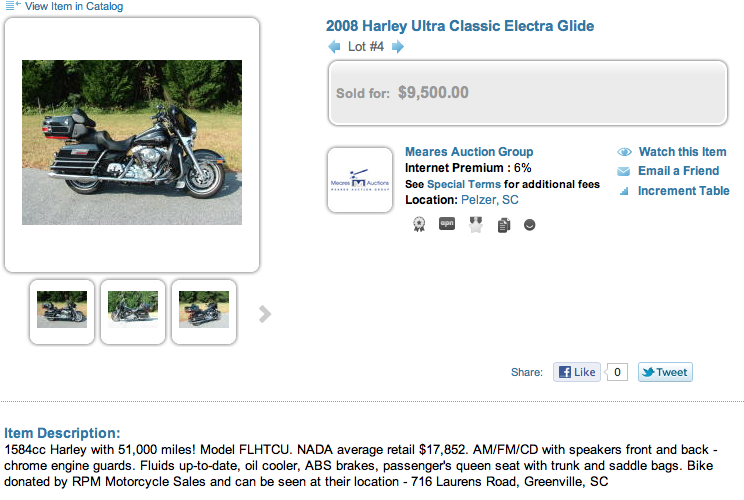 The Challenge: One of our fundraising clients approached us about selling a Harley Davidson motorcycle for them. The motorcycle was not to be added to the live auction at their event as it was donated late and the auction had already been set. In addition, they had tried to sell a similar motorcycle using eBay the year before, but the bidder did not pay for the purchase. The Solution: Through the use of our Internet platform, we were able to market the motorcycle to a larger audience than the client could have reached at their live event. In addition, our Internet platform checks for bidder fraud BEFORE allowing them to register and bid on our online auctions. Ebay does not do this, which is why the client lost the sale the previous year. The Result: The motorcycle was sold to a legitimate bidder for several thousand dollars more than the client anticipated. The buyer was local, which reduced the payment time and storage time for the client. Parting thoughts: Your auctioneer should have many weapons in his/her arsenal when it comes to fundraising. One solution does NOT fit every situation. Call us for more information or ideas! 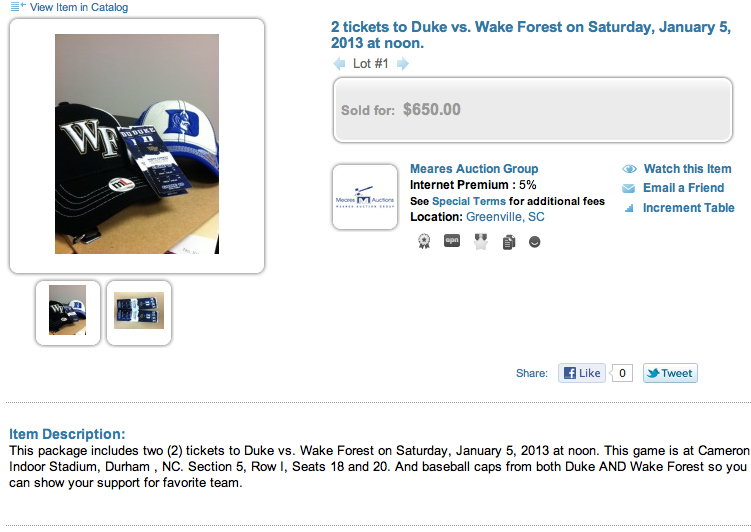 The Challenge: A client approached Bowtie Benefit Auctions with a set of Duke basketball tickets that had to be used well before the client’s actual event and fundraising auction. The Solution: Bowtie Benefit Auctions utilized a timed online auction to assist the client in selling the tickets to one of their constituents. Through a coordinated timed online auction and the client’s email list, we were able to bring exposure to the tickets AND assist the client with some pre-event advertising of their gala. The Result: The client has utilized this method several times… each time realizing money ahead of their fundraising gala AND keeping the gala in front’s of their donors. Parting thoughts: By using a timed online auction we were able to liquidate the items for our client. We would not have been able to get the items in front of the donors without the use of the Internet. Remember – YOUR auctioneer should be versed in many types of selling… not just talking fast in the front of a room! The actual auction listing for one of the sets of tickets! The Challenge: Bowtie Benefit Auctions was contacted by a client who had a US Mint proof gold American Buffalo 1-ounce coin donated to their auction. The Solution: Instead of adding the coin to the live auction at the event, we added the coin to an already-established coin auction via our Internet platform. Adding the coin to an auction with like-minded buyers assisted the client realize the most money for the donation. The Result: We estimated the coin to sell between $1650-1900. 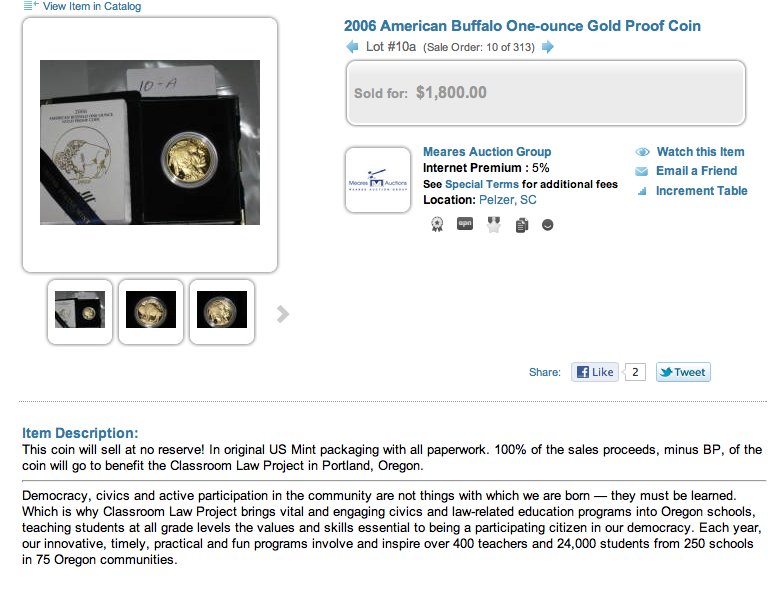 The coin sold for $1800.00 at the auction. Parting thoughts: Not every item is suited for the live auction at your fundraiser. Contact your auctioneer to make sure you are covering your bases to raise the most money for your nonprofit! We have solutions in place to help YOU raise more money… just call us. Those five words mean so much when applied. Think of the definition of singleness: the quality of concentrating on one central objective (ie. “his singleness of purpose”). This is energy concentrated toward one point… like a laser slicing right through all of the barriers to the eventual goal. The key word is concentrated… one goal, one objective or one path to success. Another way to view this is shotgun versus rifle. A shotgun is just that, a gun that releases shot – or tiny pellets – instead of one bullet. The target is covered with shot when the gun is fired… if you are aiming at the bullseye in the center, you hit it – and the inner rings, the outer rings and probably everything around the intended target. A rifle, on the other hand, releases a bullet – one shot – directed at ONE point on a target. If you aim correctly and have the rifle sighted in, you hit the bullseye. The point (all puns intended) of all three of the examples is you have to know what you want… and rifle in on it. Set goals, draw a map, make a “line” to follow – whatever you have to do – focus right in on the target and let nothing stop you! MYRTLE BEACH, S.C. – The South Carolina Auctioneers Association enjoyed incredible success at its annual convention Jan. 11-13, 2013 at Sands Resorts in Myrtle Beach. Darron Meares of Meares and Associates, LLC in Pelzer won the 2013 SCAA Bid Calling Championship. Also placing in the contest, Paul Yoder of Seneca won First Runner-Up, and Bryan Hope of Ninety Six won Second Runner-Up. The SCAA also elected Meares as its President. He will lead a 12-member board for the SCAA, which has been serving auctioneers and their staffs in and around South Carolina for more than 35 years. The SCAA has more than 110 members and associates throughout South Carolina and the United States. Several other board members were elected at the convention. Yoder will serve as Vice President for 2013. Rafe Dixon of Sumter has been tabbed for Secretary/Treasurer. Hope as well as David Yoder of Fair Play will serve four-year terms as directors. Marshall McAbee Jr. of Greer will serve as director through 2015. Ligon, the outgoing president, has been promoted to Immediate Past President. J. Tony Adams (Elloree), Merle Sharick (Prosperity), Gwen Bryant (Florence), David Taylor (Inman) and Robert Robeson (Chesterfield) remain as directors on the board. Visit SCAA’s website at www.SouthCarolinaAuctioneers.org, or contact the SCAA office at 919-876- 0687, for more information about SCAA, its members and driven purpose. Contact SCAA Executive Services at 919-876-0687 or scaa@southcarolinaauctioneers.org for further information. Photos available upon request. For more than 35 years, the SCAA has connected, educated and represented auctioneers within and around the state of South Carolina. Its membership continues to climb as auctioneers learn the value of membership as a tool for their future in the industry. When conducting fundraising auctions, many clients ask what an item should sell for at the event. Most times when I hear that question I step back into the world of asset appraisals… by the way, in addition to being a fundraising auctioneer, I am also a Master Personal Property Appraiser. So back to the title of this post – the market is the expert. The market is, in general, who you are selling to. Secondarily, other factors play into this – location of the event, timing of the event and the audience you are selling to. If you have an event in Charlotte, NC on June 1, 2012 with an audience of 350, you are going to achieve different results on a Carolina Panthers football game Sunday. The point is dynamics change… so do audiences and prices realized. Again, no matter if item ABC brought $4,000.00 at last year’s event… those two bidders’ children may have left the school at the same time… thus yielding an item that may not be alluring to this year’s audience. How do you achieve greater results? MARKET THE ITEMS! Each of these require EARLY procurement of the live auction items. If you do not have this luxury, make sure to highlight what you are raising money for – especially if you are part of a school fundraiser where you have specific items you are funding. One of my favorite Jimmy Buffett songs takes me straight to the coast of South Carolina on Labor Day weekend. We are fortunate to live a little over two hours from the coast and our family’s beach house at Isle of Palms. This song has always taken me right to the point of packing up the car and driving back home for another year of fall and winter… that last look at the warm sand of the beach, the last rush of the waves crashing on the sand, the last smell of coconut oil wafting on the breeze… have a huge Labor Day wherever you are! Wisdom of Steve Jobs as a Catalyst? A catalyst… a person whose talk, enthusiasm, or energy causes others to be more friendly, enthusiastic, or energetic. I love it! Another way to look at it is a person or thing that precipitates an event or change. There are catalysts all around us – those that kick off a reaction just like reactions we studied in Chemistry 101. Steve Jobs said in the Stanford University commencement address of 2005: Getting fired from Apple was the best thing that ever happened to me. The heaviness of being successful was replaced by the lightness of being a beginner again, less sure about everything. It freed me to enter one of the most creative periods of my life. What do you need to change to boost your creativity? What is YOUR catalyst? Mine is finding a solution to a problem within my industry. I love writing seminars and courses to help those in my industry (auctioneering) to assist their clients and customers. I see a problem, or potential problem, and do my best to come up with solutions. THAT boosts my creativity. Find your catalyst… find something that changes your situation. Find something that changes your outlook. Find something that changes your life and those around you! Blogging is a catalyst for me. My writing dried up. Making myself put words on the screen is a lot easier for me now – I actually look forward to finding new topics to write about! A little more from the Jobs Stanford University commencement speech: The only way to be truly satisfied is to do what you believe is great work. And the only way to do great work is to love what you do. If you haven’t found it yet, keep looking. Don’t settle. I am a professional fundraising auctioneer. My clients are the boss. End of story. They are the ones that agree to my rate, the ones who give me the product to sell or the fundraising goal for the evening and they are the ones who put ink on the contract. I am hired to make the most money for the client as possible within the given parameters (time, date, place, timeline, number of items, etcetera). My joke when I talk with groups is, “my job is to not let a dollar leave the room.”. Tobias Meyer, the auctioneer at Sotheby’s who sold Edvard Munch’s ‘The Scream’, said it best in a Wall Street Journal interview, “I am hired at that moment to make the work as expensive as possible.”. Thus the job of the auctioneer. A true auctioneer has his client’s best interests in mind – within the letter of the law – and is hired to make every item in the auction as expensive as possible. This is the case with nonprofits where the goal of the evening is X amount of dollars to keep the doors open… it could be the youth group needing X amount of dollars to go on a retreat. It could be a myriad of things. The auctioneer with knowledge of the product (Meyer has a master’s degree in art history from the University of Vienna) will command the most money from those in the room… thereby raising as much money as possible for the client. This correlates to the professional fundraising auctioneers who work six to nine months with their clients to learn about the cause AND the items being auctioned at the event. Those ‘hit it and quit it’ auctioneers that chase a dollar – those hired guns who run in and call a few bids and leave – are not doing their boss, their client, justice. There are plenty of fundraising auctioneers in the United States who will agree with me. If you are part of a group raising money for a cause, on a nonprofit board or someone just curious about this segment of the auction profession, do your homework. Ask questions. Interview the auctioneer you choose to represent the organization. I’ll leave you with with 12 words: You get what you pay for and pay for what you get. “Whoa, lookin’ back at my background/ Tryin’ to figure out how I ever got here. Some things are still a mystery to me/ While others are much too clear”. Migration, from the album A1A by Jimmy Buffett.